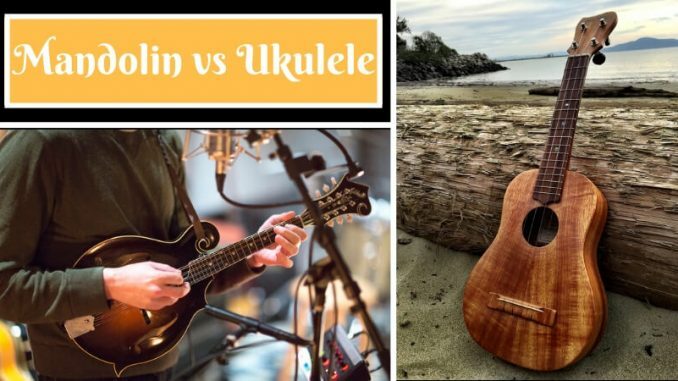 Home » Blog » Comparison » Mandolin vs Ukulele: Which One is the Best Instrument? It is essential to know all the properties of an instrument correctly along with its advantages and disadvantages before purchasing it. Mandolin and Ukulele are often thought of like the similar instruments because both belong to the lute family. In size, the mandolin is generally bigger than Ukuleles, but sometimes big Ukuleles have the same size as that of a mandolin. People who have been into music know that there are differences between both the instruments. It has wooden body. It generally has wooden body but Some variants have plastic body partially or entirely. The shape is generally round or teardrop. It has an oval shape like an acoustic guitar, also often shaped as “pineapple”. It has two sound holes like violin. It has one sound hole like guitar. Ukulele has four strings which are made up of nylon are tuned to GCEA. Out of the four strings, G string is tuned higher than C and E. It makes easy for people to play this instrument with bare hands without any harm. There is no hard pick needed for strumming this instrument. Whereas Mandolin has four pairs that are eight strings of steel which requires a hard plastic pick to play the instrument. It generally has four pairs or 8 strings and are tuned in unison as GGDDAAEE. The number of strings can differ, like sometimes there five pairs of strings or 6 pairs of strings. Mandolins have a louder sound comparatively and hence are used in American folk, European classical and traditional music. It is also used in bluegrass music. It can also be used with other instruments such as Guitar, banjo, etc. Whereas Ukuleles have melodious sound due to the nylon strings. It is used to play music that is used in folk music or is accompanied by singers. As mandolins have steel strings and strumming is needed, it becomes important to be precise with the notes. Many people like it as it has a timbre sound and can be distinguished easily if played with other instruments. There are also people who like Ukuleles due to it’s sweet and low tone sound. The price range of both the instruments differs as mandolins are in the range of $300 and above, whereas Ukuleles are available in market at a price under $100. Very cheap Ukuleles are also available at $50. All factors mentioned above should be known thoroughly before making a choice. The price range is high for mandolin, but sometimes cheap Ukuleles are not of good quality. If you are someone who is looking for a sweet, musical sound tone you should opt for Ukuleles. Both these instruments give a pleasant sound and are liked equally by all, but if you are in a group where people play other instruments as well, or in a group of singers than buying a mandolin accompanies you is a much better choice as it’s sound is much loud and distinguishable.